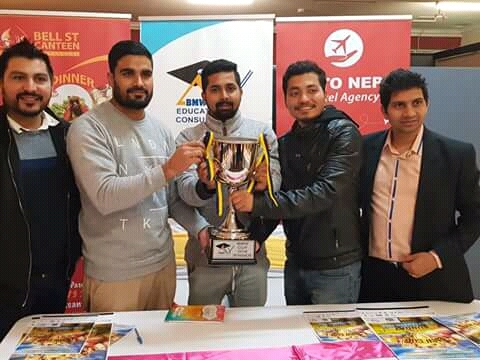 BMW Educational Consultancy Melbourne Presents BMW Cup 2018, organized by Royal Rhinos Cricket Club and Managed by Victorian Nepalese Cricket Association. 8 weeks long BMW Cup will commence from 9th September in Melbourne. As we already mentioned in our previous article, 3 matches will take place in single day (Sunday) and play will take place on every Sunday of 6 consecutive weeks, starting from 9th September. Today’s (Sep – 01) media release on Bell st canteen finalized 7 participating teams name, winning prize and venue of the tournament. Winning side will be honoured with $2000 (rs 163760). It is the highest winning prize amount till date in Nepalese community. Organizing club, Royal Rhinos Cricket Club will be lead by Niraj Shrestha. Sunam Gautam is undoubtedly a star player of the tournament, who will be leading Expert Cricket Club. Gautam had signed two-years contract with Victorian Premier League outfit Greenvale Kangaroo Cricket Club in 2014. He is currently playing for Footscray Cricket Club with handy batting average of 25. Another talented batsman, Kushal Tuladhar, will be leading Sagarmatha Cricket Club. He used to play in Morang (Eastern district of Nepal) in his young age. Opening ceremony of the tournament will be held on 9th September itself. All the matches will take place in Boeing Reserve Strathmore, Victoria, Australia.